This is a wallpaper i made. It is really somewhat rare to see brushes used in a way like this. Usually with a composition like this you would think like shapes, pentool and all sorts of other really funky things (not that brushes aren't funky)- but really, it's quite refreshing to see brushes being intensively used in a way that's really clever. It might just be me, but seeing extracted images (and manga ones at that!) blended together is something in my memory that has almost been forgotten! But having said so, this is the beauty of this wallpaper- this is a great example of having multiple scans and making it funky. Not only are the brushes used well, scans used well and placed well, the colours are used in a sophisticated way. There is a high level of control and deliberation in this, yet it is so fluid and just bleeds (haha pun not intended!) into image after image. Lol. Full marks for the wallpaper- maybe not so full marks for the description ;) ... but <3 the use of text. Proposed by bromithia and highlighted by kuroimisa. 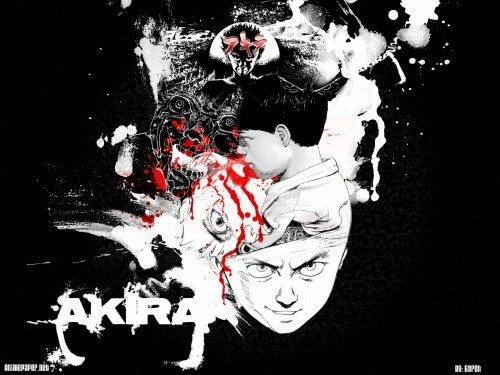 This wallpaper represents the craziness of Akira perfectly. I love it. Well done image. Nice collage of Tetsuo. Wow! Akira rules! Great job. instant background material, you did a very nice job, thanks for uploading. outstanding work, great chaotic look within the mind of Tetsuo, good job !